The sixth entry in The Lost Stories is ‘Point of Entry,’ a script adapted by Marc Platt from an outline by ‘Enlightenment’ writer Barbara Clegg. Expertly blending history and pseudo-history, the tale of the Doctor and Peri landing in Elizabethan England after avoiding a rogue asteroid in space dovetails wonderfully with playwright Kit Marlowe’s attempts to write Doctor Faustus as the cadaverous Spaniard Velez searches for an Aztec stone blade and the ominous Omnim’s point of entry approaches. Christopher Marlowe is practically the perfect character to include in Doctor Who, his interest in the occult and his possible work as a British spy creating the perfect backdrop for a rich tapestry of charcterization, and Matt Addis brings out the internal conflict of this fascinatingly complex individual exceedingly well. Fortunately, Platt also manages to bring the supernatural facets of the corpselike Velez to life just as successfully, his plan to reunite the mysterious ancient blade and hilt always imbued with gravelly menace and mysticism while allowing a more grandiose and bombastic personality to occasionally peek through. Of course, the brilliant ideas that form the basis of this story help the strong performances shine even more, and beginning the tale with a rogue asteroid that seems to be communicating with the TARDIS and suddenly changes its course of direction is a visually stunning means of setting events in motion, contrasting well with the plague-ridden Elizabethan London in which scandal rules the theatre and severing a tongue is considered a just punishment. As a world of dark secrets on Earth gives way to the astral plane and the millennia-old history of the Omnim who accidentally destroyed their own world through created vibrations but managed to project themselves onto one final fragment of rock tumbling through space, the increasingly supernatural tale blends perfectly with the gritty realism of London and the dark history of the Aztecs as the Omnim’s fear-filled and titular lunar eclipse approaches. 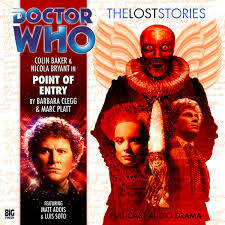 As has been the trend with most of The Lost Stories, ‘Point of Entry’ also excels with its continued progression and amelioration of the Doctor and Peri both as individuals and as a duo. Part of this may be down to the fact that the audio script was adapted from an outline rather than an actual television script, meaning that the typical Big Finish nuances that have pervaded the two leads over the years seamlessly make their presence known. As a whole, this ‘lost’ season is arguably the strongest of Colin Baker’s tenure and offers tantalizing glimpses at the compassionate, humorous, and dominant force the Sixth Doctor would have become if afforded the opportunity to bridge the two full televised seasons. At the same time, ‘Point of Entry’ once more places a greater focus on the companion than was typical of the intended time, and Nicola Bryant again excels as Peri proves vital in both life-threatening and comedic situations to progressing the plot through all of its twisting turns. The direction and sound design cap off this unsung classic, evoking quiet tension and robust drama perfectly as needed. At times chillingly dark and at others genuinely funny while culminating in a superb finale, ‘Point of Entry’ is arguably the strongest of this new range, encapsulating the very best of Big Finish while unquestionably remaining true to the classic era.